Every bride would want to look her best in her wedding lehenga and blouse on her special day, she needs to follow all the best lehenga blouse trends through online and offline modes. Wedding magazines further peak a bride’s expectations, where nothing but the best would be good enough for her. Thus, every wedding is preceded by frantic scouting for showrooms offering the best of wedding attires and best lehenga blouse trends, which is followed by loots conducted at these wedding-centric shops. This experience is rather stressful and some brides prefer to have their clothes tailor-made. The lehenga and blouse not only have to fit her well but needs to get along with her personality. The Simple Velvet Blouse is the classic lehenga blouse. It is nothing flashy, but the simplicity of the blouse can be compounded even more by intricate embroidery. Often this embroidery is in colours like Gold or Silver. Velvet material has its own attractive shimmer and offers a perfect fit. It gives the body a slim and toned appearance. Velvet is usually available in royal colours like Navy Blue and Deep Maroon that can go with almost every other colour scheme of clothes. 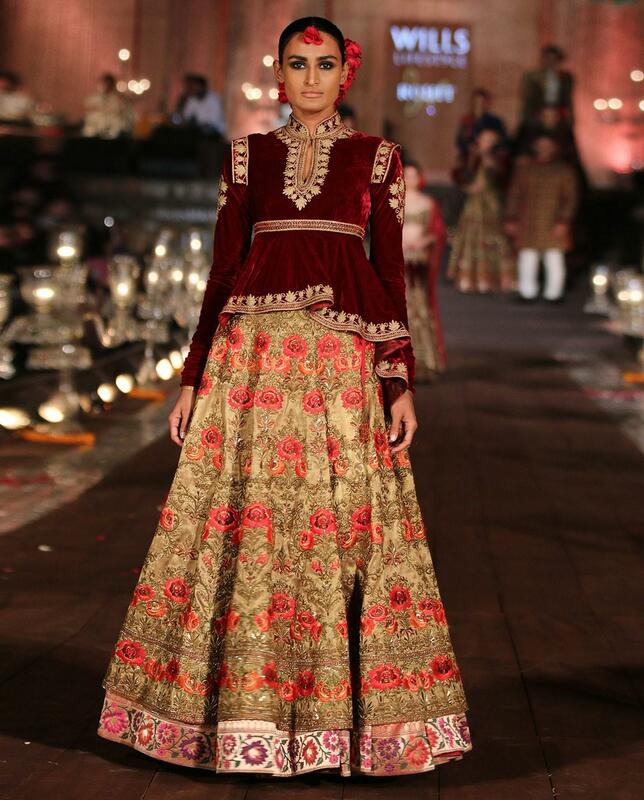 The added advantage is that velvet compliments other lehenga materials too and the feel of it on the skin is amazing! Long Blouse is yet another sombre looking blouse but has a touch of class. These blouses do not have to heavily embroidered and even pretty prints can accentuate the beauty of such blouses. Often paired with similarly printed lehengas, this combination will also save up on unnecessary expenses of investing in a lehenga blouse that may possibly be worn just once. Plus, given that it has a stylish look, it can even be worn at other fancy parties. Bordered Lehenga Blouses are made out of plain blouses with the magic of laces, silk, and floral designs. These add-ons are made in contrast with the colour of the blouse. This gives the freedom to the bride to have her blouse customised according to her needs. Adding these borders gives the blouse a cute waistcoat-like appearance. This blouse goes well with lehenga skits and lehenga sarees too. Patterns are in fashion and including these in your wedding lehenga blouse will make you look chic and fancy. Patterns could be printed patterns, embroidered patterns, beaded patterns, sequined patterns and patterns formed out of pearls. Patterns offer the best lehenga blouse trends. Full sleeve blouses give a greater surface for the patterns to exhibit their effects. Chiffon blouses give a beautiful sheer look and highlights the patterns. Brocade lehenga blouses are all-time favourites and never get old. Brocade designs are minute, detailed, and pleasing. These best lehenga blouse trends can be full sleeves, half sleeves, mid-sleeves, micro-sleeves and sleeveless. These blouses look better with deep back cuts. Brocade blouses can get along with all materials, and all types of lehengas. It gives a traditionally ethnic look but adds a touch of modernity based on designs. Boat necks are stylish and accentuate the neck and shoulder region. It is for those going for a fancy look. For an even bolder look, brides can even settle for an off-shoulder lehenga blouse. It will have heads turning and people admiring the bride’s beauty. If paired with a beautiful pleated and embroidered dupatta, the boat neck blouse can give a regal look. Cold Shoulder tops are in fashion, then why not Cold Shoulder Lehenga Blouse too? Also known as cut tops or cut blouses, the cold shoulder blouses are paired with modest necklines. They look wonderful with sarees and lehengas. They can be glammed up through prints, sequins or embroidery. Even as plain blouses, they look amazing still. Peplum Lehenga Blouses will literally make the waves. Peplum blouses are generally made of free-flowing materials like silk and chiffon, that makes the fall of the material look stunning. Peplum blouses are also available in jacket styles. Peplum can also be tricky because special attention should be given to body types, choose a peplum style that suits your body type and you can never go wrong. Corsets were worn in old times to give the body a certain shape. This kind of lehenga blouse will definitely leave everyone breathless. It will give the bride to show off her curves. They can be in a fully covered form or in the tube top style. Nevertheless, they make a great and racy addition in your closet.